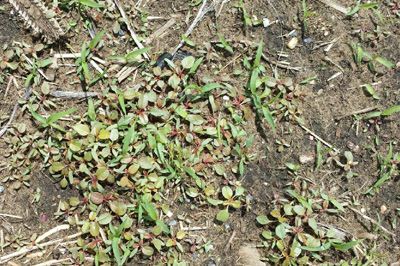 Planting progress may have been slowed by the recent precipitation, but weed emergence continues despite wet field conditions. Be aware that Palmer amaranth has begun to emerge. We scouted our Palmer amaranth field location west of Kankakee on May 8 and observed emerged Palmer amaranth plants (Figure 1). We returned to the field on May 15 to find a very robust Palmer amaranth population (Figure 2). The largest Palmer amaranth plants found on May 15 were approximately 2 inches tall with 6 to 8 true leaves. Some leaf petioles on older Palmer amaranth plants already had elongated to approximately twice the length of the leaf blade, but we did not find any leaves with chevrons or watermarks. Extension weed scientists in Iowa and Ohio also have reported finding emerged Palmer amaranth plants in their respective states. 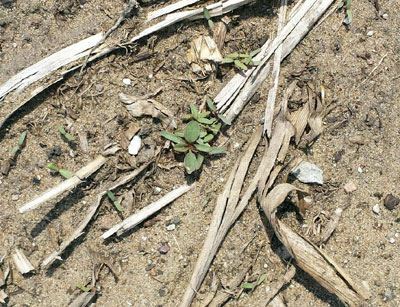 Completing corn and soybean planting will assume top priority when field conditions are again suitable, but please do not overlook the need to control emerged Palmer amaranth in fields already planted. The return of warm air temperatures coupled with ample soil moisture will help emerged Palmer amaranth plants grow very rapidly. Postemergence herbicides should be applied before Palmer amaranth plants are taller than 4 inches. It is NOT advisable to delay the application of postemergence herbicides until additional Palmer amaranth plants emerge. Delayed application of postemergence herbicides, whether by choice or due to adverse weather conditions, can lead to disastrous outcomes.